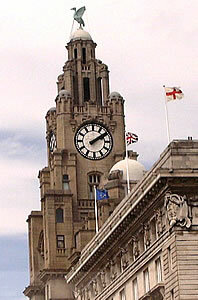 Liverpool is a major city in England (2001 population: 440,000). 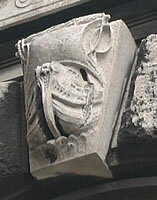 The town was very prosperous in the 1700s and 1800s. Although the industries on which it depended declined in the 20th century, recently it has been enjoying a revival. It has been chosen as the European Capital of Culture in 2008: this is expected to bring additional investment and tourism to the city. On the banks of the River Mersey in the Albert Dock are some beautiful buildings called the Port of Liverpool Building, the Royal Liver Building, and the Cunard Building, all of which are connected with the shipping business. 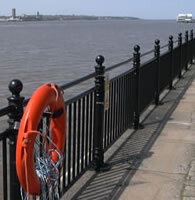 The River Mersey used to be a busy trade route. 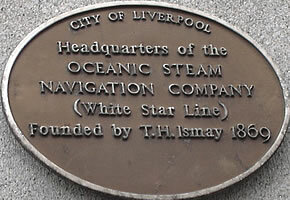 Liverpool was one of the key ports used for the slave trade: many Africans slaves were transported to the Caribbean to work on sugar plantations. The slave trade had a big effect on the local economy: much of the money used to construct the magnificent buildings in the city came from this source. The river leads into the Irish Sea. Many Irish people came here when disease destroyed the potato crops in Ireland (the "Irish potato famine") in the middle of the 1800s - a large number of them travelled on to America, but others settled here in Liverpool. Ferries go both across to the other side of the river, and to Ireland and the Isle of Man. 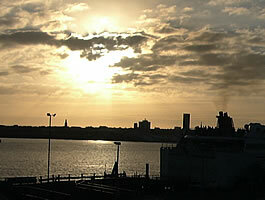 There is a well-known song from the 1960s by Gerry and the Pacemakers called "Ferry cross the Mersey". 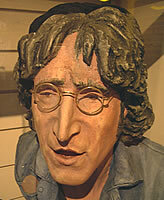 The Beatles - John Lennon, Paul McCartney, George Harrison and Ringo Starr - all grew up in Liverpool. 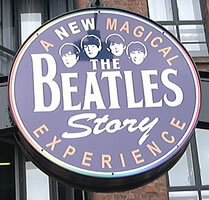 This tour of Liverpool includes a visit to a museum called "The Beatles Story" (on Gower Street, close to the Albert Docks). 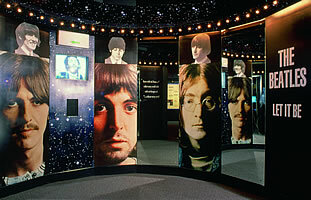 An audio guide brings to life both the music and history of the Beatles. 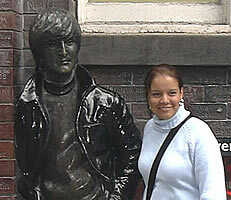 Allow at least an hour to go to the museum and visit the Beatles shop. 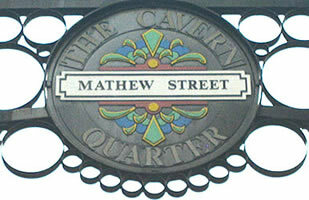 The area of Liverpool around Mathew Street is known as the Cavern Quarter. 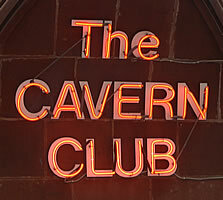 The Cavern Club was where the Beatles used to perform when they started as a local band in the early 1960s (the original site has been replaced by a supermarket, but a copy of the original has been created using the original bricks). A "wall of fame" shows the names of the many bands which have performed at this club. 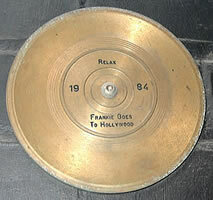 Another nearby display shows a series of gold discs, each one representing a pop star from Liverpool who has reached number one in the UK charts (the disc shown below is for the song "Relax" by Frankie Goes To Hollywood). 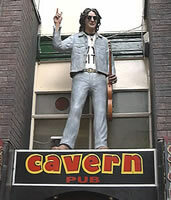 The nearby Cavern Pub has a Beatles theme, and has an image of John Lennon above its entrance. 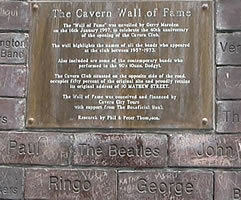 There are other sites in Liverpool which are associated with the Beatles. 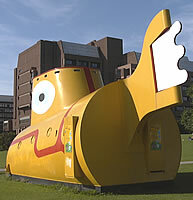 In Chavasse Park there is a yellow submarine, based on the cartoon design in the film "Yellow Submarine". 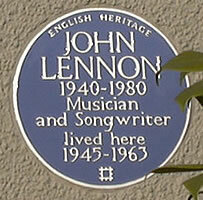 Many of the songs of the Beatles were inspired by places and people that were familiar to John Lennon and Paul McCartney (the songwriters). 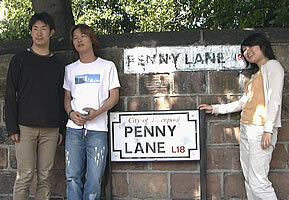 The song "Penny Lane" is about the people who lived in or around this road, which is in one of the suburbs of Liverpool. Strawberry Field (the name used in the song "Strawberry Fields forever") is a home for children in care (those who have been taken away from their parents for some reason). 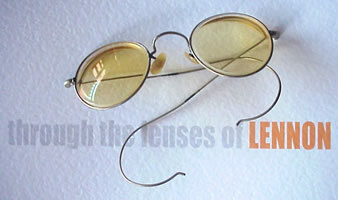 This is run by the Salvation Army (a Christian organisation which aims to help the poor). 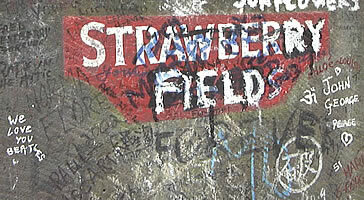 John Lennon used to play with the band at Strawberry Field when he was a child. 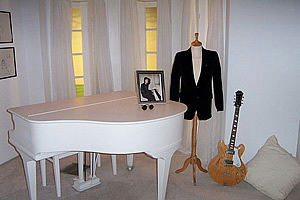 The childhood homes of John Lennon and Paul McCartney (Mendips and 20 Forthlin Road) are managed by the National Trust, who organise tours which allow visitors to see inside the buildings. 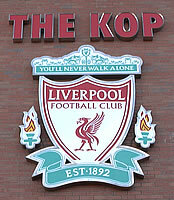 Liverpool Football Club is one of the most famous teams in the UK. 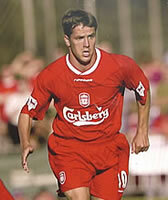 Its stadium is called Anfield, named after the area where it is located. The stand behind one of the goals - where the Liverpool supporters normally sit - is called The Kop. 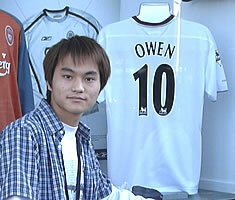 The team's most famous player in recent years has been Michael Owen, who used to play here in his Number 10 shirt (from August 2004 Michael started playing for the Spanish club Real Madrid, and started playing for Newcastle in 2005). 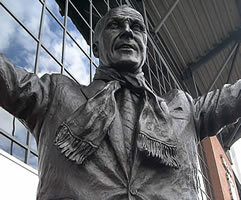 In front of the stadium is a statue of Bill Shankly, who was extremely successful while he was the manager of the club. There is a shop inside which selling lots of Liverpool football goods. 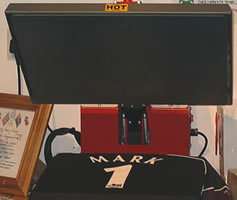 You can ask them to make a shirt with a name and number which you choose. 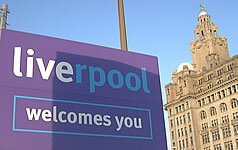 Liverpool also has another successful football club called Everton. 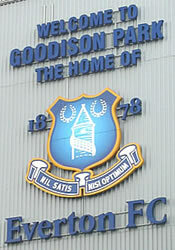 The stadium is known as Goodison Park (not far from the Kop). The most famous player in recent years has been Wayne Rooney, who became very well-known after his performance in the Euro 2004 championship. 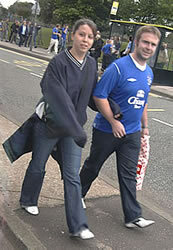 In August 2004 Wayne Rooney was sold by Everton to the British team Manchester United. 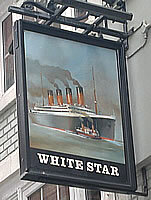 There are many other attractions to visit in Liverpool. 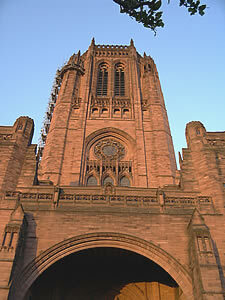 The Anglican Cathedral is made of red sandstone and is built in a Gothic style. It was completed in 1978, and is the largest Anglican cathedral in the world. 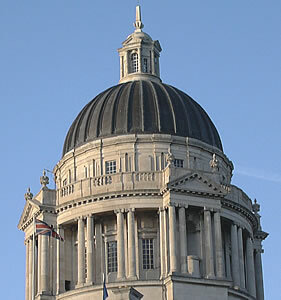 There is also a modern Roman Catholic cathedral (the large Irish community in Liverpool is mainly Catholic). 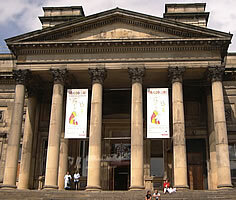 There is a wide range of museums in Liverpool, and entrance for many of these is free. Some of the most popular of these are the Walker Art Gallery, the Tate Gallery Liverpool, the Liverpool Museum, the Maritime Museum and the Museum of Liverpool Life. The International Slavery Museum opened in August 2007 in the Albert Docks. 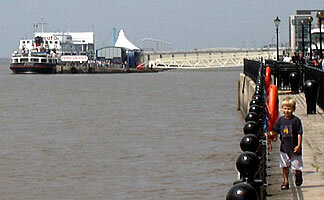 Liverpool has produced many famous pop groups. Below is a list of some of them, together with the name of one of their songs. How many of these do you know? For train timetables and to buy a ticket online: Shop/Company/TheTrainline. 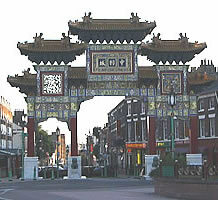 "The city is in the midst of a major programme of urban redevelopment ... It's well worth making time to explore Liverpool properly. The Albert Dock, Western Approaches Museum, twin cathedrals and city streets themselves offer vivid testimony to the city's rugged history, while its nightlife is rich and varied enough to guarantee almost anyone a good time"